H. Rick Bamman - hbamman@shawmedia.com Working in the Salvation Army community center in Crystal Lake, volunteer Cassie Petersen, a senior at Prairie Ridge High School , hand picks back-to-school supplies to be packed in backpacks for distribution by the Salvation Army on August 5 and 6. The Salvation Army expects this to be their busiest year to date with demand for back-to-school supplies climbing. H. Rick Bamman - hbamman@shawmedia.com Working in the Salvation Army community center in Crystal Lake, volunteer Makenna Schmitz, a senior at Prairie Ridge High School , hand packs school supplies into one of hundreads of backpacks for distribution by the Salvation Army on August 5 and 6. H. Rick Bamman - hbamman@shawmedia.com Hundreds of No. 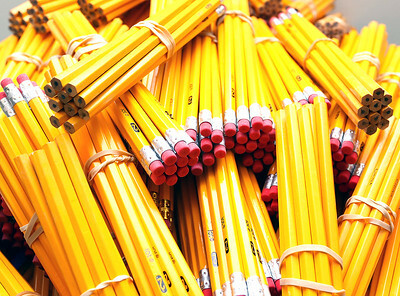 2 pencils await placement in backpacks as part of the The Salvation Army's back-to_school supply program. Distribution is scheuled for August 5 and 6.